Many merger/acquisition events are likely to be unpopular, at least with those groups of employees who are negatively affected. What people don’t like, they will probably resist. Management cannot keep everyone happy. But a number of things can be done to overcome some of the resistance and minimize that which remains. 1. EXPLAIN THE REASONS FOR THE CHANGE. Usually the best steps in dealing with problems are the preventive ones. Perhaps the most effective way to minimize resistance is to make sure people in the organization have a good understanding of the rationale for the changes. The people in charge should be very open, very willing to share their perspectives or the line of reasoning that led to the changes. When this sort of information is communicated, the odds increase that everyone else will come to see the move as appropriate. But even those personnel who disagree with the logic behind the change, and who are personally against it, are far more likely to accept the situation than if they had it shoved at them without any explanation. So giving people in the workforce the story behind merger changes is helpful in several ways. First, some people will be persuaded that the move was an appropriate one. Others will not be convinced, but at least they will understand why it’s happening, and therefore will accept it. Finally, still others who neither agree with nor understand the reasoning behind the change will elect not to fight it, because at least someone took the pains to try and explain the situation for them. 2. LEVEL WITH PEOPLE ABOUT THE PATHWAY TO CHANGE. There is a need for people to understand what the road to change looks like—that typically the pathway is a sequence of events where things get worse before they get better. Several brief examples may help make this point. First, think of the young boy who wants to learn how to ride a bicycle. He can walk without any problem and generally gets where he wants to go. But his mobility actually becomes less successful when he starts trying to ride the bike. He falls down, bruises an arm, scrapes a knee, and cannot make forward progress as well as if he were walking. His mobility actually deteriorates. But he keeps working at the change, and pretty soon is traveling in a faster, more pleasurable style than he was when merely walking. Similarly, consider the example of a woman with circulatory problems who enters the hospital to have heart surgery. She may very well walk into the hospital feeling quite fine. However, they will wheel her out of the operating room flat on her back, keep her in intensive care for a while, and generally weaken her physical condition such that she cannot be very active for a period of days. So in a sense she’s gotten worse, but that’s part of the pathway toward overall improved physical health. 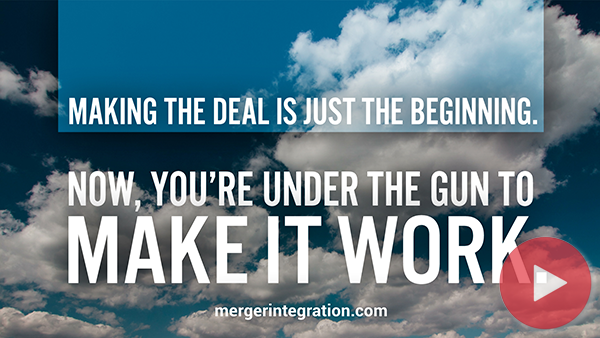 Mergers, and the changes they bring, typically reflect the same sort of sequence. Top management needs to prepare employees for this scenario. Growth—and mergers usually imply organizational growth—generally carries a little bit of pain and discomfort with it, and these growing pains are part of the process that people need to understand and expect. 3. ARRANGE FOR PARTICIPATION AND INVOLVEMENT. Participation is critical to a successful change effort, but indiscriminate participation creates its own set of problems. Conventional wisdom has held that participation brings ownership of ideas and that ownership generates commitment. This argues that instead of trying to force change down people’s throats, there is a need to get them involved in the process of designing the change and planning how it is to be implemented. This is not to say, though, that people should be sourced for their ideas and opinions automatically. If they don’t know about the subject at hand, there is reason to question how constructive their ideas might be. When they don’t really have much at stake in the outcome, their contribution may be questionable. Further, if the person soliciting their involvement doesn’t really give a hoot about what they have to say, it might be better not to even go through the motions. Participation is valuable when the people involved are capable of contributing worthwhile ideas. It can be a productive exercise when the participants are able to help define and solve key problems. But mere participation for participation’s sake can be highly dysfunctional. It can waste people’s time and energy and result in an overall weaker game plan for change. So the key to effective participation is involving the right people. When that happens, people do end up with a better understanding of how complicated the situation is. And if there are no perfect solutions—which there almost never are—then they are probably going to be much more inclined to live with “reasonable” solutions that are fair minded and that they have helped to shape and bring to life. 4. PROVIDE A CLEAR SENSE OF DIRECTION. In the disordered environment of mergers and acquisitions, where changes themselves are constantly being changed, employees need an aiming point. They need a target to shoot at. Otherwise, there is a tendency to wallow or flounder in the waves of change. People will resist the changes because they cannot determine where the new forces are carrying them. There are two very important components to the needed sense of direction. First, there need to be very short-range objectives that are specific, highly structured, and vigorously promoted. But at the same time there needs to be an overarching goal, something that people can orient toward well into the future. There is much less resistance to change when people can view the changes as part of their pursuit of a vision. This visionary objective gives employees something they can get excited about. It needs to be articulated by the leader, and should be the sort of challenging goal that might be defined as a unique mission, calling, or purpose that really inspires people. This is the kind of thing that can justify for employees all of the upheaval, confusion, stress, and destabilization that change brings. In other words, vision is what allows people to conclude that all the effort and headaches associated with change are worth the price. When things are changing, when an organization is destabilized, people need someone to follow. It has to be someone they have confidence in, someone they feel has the ability to lead them out of the struggle safely. When leadership is missing, resistance festers and spreads. All too often when a company is being acquired and merged some of the key people— who are the best leaders—leave the scene. Others get reassigned, with the result being a lot of people who feel they have been left leaderless. They easily fall into the ranks of the passive resisters. 6. MOVE RAPIDLY IN MAKING THE CHANGES. A key step in managing past resistance to change is to expedite the change process. This is not to advocate recklessness or a haphazard approach. But very often the people in charge decide they don’t want to overwhelm their employees with change. So out of the spirit of compassion or misguided sensitivity, they put together what sounds like a very logical argument for staging changes in a fairly slow-paced or measured fashion. On the surface this sounds like a very humanitarian approach. The problem is, it simply doesn’t work. Almost always, people instinctively know when this is happening, and they end up feeling like they’re kind of hanging in the wind. They intuitively realize that the changes aren’t all made and that things aren’t “finished.” This adds tremendously to the uncertainty of the situation. So while the people in charge may elect to move slowly and thus not overwhelm their people with change, they are likely to overwhelm them with ambiguity. The most promising approach is to make the needed changes rapidly and get them over with. Sure, it should be done in an informed fashion and not willy-nilly. But the company should move with real dispatch rather than dragging things out. So often what people really resist is the sluggish pace of change, or the ambiguity and uncertainty that accompany the change because everything is proceeding so slowly. The kindest sword is the one that cuts quickest and cleanest. So don’t “hack around,” making the changes over a long period of time. That just prolongs the agony. It creates more pain and suffering, while also slowing down the healing process. It’s not hard to understand why people would resist that. When people have doubts about their own ability to perform up to par in a new situation or under a new set of expectations, their primary defense may be to resist the changes that are threatening. It’s human nature not to want to set ourselves up for failure. Frequently, people are against change not because they are opposed to it per se, but rather because they lack the skill, talent, or simply the understanding needed to cope with it very well. If they are given the necessary training and coaching on how to handle change effectively, the resistance can disappear. All too often, though, companies are acquired and merged without employees ever being given sufficient guidance or assistance on how to do things the new way. To begin with, people are likely to need help in understanding merger dynamics together with training on how to manage transition and change. It’s a very different process from “maintenance management” or taking care of the status quo. Ordinarily, there also are technical matters that are handled differently from one company to the next, and if they are to be synchronized, employees can benefit from training. Invariably, the parent company and its acquisition will need to reconcile numerous formal policies and procedures as well as a variety of unwritten practices. Rather than have people struggle along for months trying to figure out on their own how to do things according to the new game plan, special training sessions should be scheduled very early in the merger integration process. The area where a specialized kind of training is almost always needed, and is usually ignored completely, has to do with the complex area of corporate culture. In spite of the fact that corporate culture has a pervasive and profound influence on employee behavior and the way business is conducted, acquiring companies take it largely for granted. They more or less assume that those personnel who are being acquired and integrated will manage to “catch on” and get the hang of it without any help from the parent firm. The truth of the matter is that companies find it difficult even for themselves to identify all the important, deeply held beliefs and corporate values that comprise its culture. How much harder, then, is it bound to be for newcomers to really understand what’s going on and why? Granted, having more of an outsider’s perspective, people from the acquisition will quite readily perceive certain values and beliefs that people in the parent company are oblivious to. But they need to be provided carefully orchestrated training—indoctrination, if you will—on the new corporate culture within which they will be expected to operate. In the absence of such training, acquired company personnel are likely to be accused of resisting change when, in fact, they are just doing what comes naturally, unaware that it is not in sync with what the parent company expects. 8. CREATE A SUPPORTIVE ENVIRONMENT. Change is accepted by people more readily in a nurturing, supportive environment. When this kind of atmosphere exists, people are more willing to take some risks and experiment with new ways of doing things. If they feel threatened, insecure, or vulnerable, they become inhibited. They don’t want to go out on a limb. They become more cautious, more tentative and, quite frankly, more likely to fail. So the people in charge need to concentrate on shaping people’s behavior instead of grading people’s behavior. This is almost an attitudinal issue. People very quickly get a feel for the boss’s or leader’s stance. They can intuitively grasp whether or not there is much safety in trying to do things the new way, and maybe failing or at least falling short to some degree. That creates an environment where people flourish, and where change can take root. The boss needs to give positive strokes merely for movement in the right direction instead of waiting for people to get it perfect. 9. MONITOR THE CHANGE PROCESS CAREFULLY. Another key point in overcoming resistance to change is to keep tabs on the situation. More than likely there will be problems that develop. Certainly if the change is very complex or very involved, there will be some glitches. If these problems aren’t sniffed out and met head-on—that is, sensibly addressed by top management—then the people are going to bow up. They are going to become more resentful. Furthermore, they will view the problems as tangible evidence that the changes were poorly conceived, destructive, and less effective than the old way of doing things. So managers and executives should really keep a finger on the pulse of things in terms of how well the changes are going, or how well the new approach is working. Essentially, what is being said here is that top management should go looking for trouble and be particularly alert to bad news. People should be encouraged to come forth with their complaints, concerns, and gripes—that’s how management ends up with the information needed to fine-tune the situation. Sometimes the information that comes forth when people gripe and complain or offer suggestions may be very faulty. It may be off target, and a very parochial viewpoint. Nevertheless, if that is the perspective or the viewpoint of the people who have to live with the changes and who will carry a large part of the responsibility for making the changes work, then those opinions are important. Success at overcoming resistance to change is heavily dependent on keeping the information channels open. The company should do whatever is possible to keep the communication flowing regarding what’s working, what’s not, and what’s needed. If people don’t feel comfortable coming forth to express their problems or report the difficulties they’re having, resistance is just driven underground. The result is a bunch of employees who may mouth the party line before top management, but who behind their backs proceed to undercut the changes and keep them from working. Sometimes managers will find that in their particular part of an organization the change isn’t working well at all. There will be feedback from their people, or they may observe firsthand, that there are some very significant problems. It is entirely possible that some of the change will have been ill-conceived or poorly implemented. Maybe those changes were force-fed to the managers. Maybe they didn’t have any say-so in deciding whether or not the changes should be made in the first place. Perhaps these were directives that came down from on high, with the managers simply being charged with the responsibility for implementing them and making them work. When they aren’t working, or when some real fine-tuning is needed, managers have to have the nerve or managerial courage to report problems to their superiors. And they may not want to hear that upstairs. It takes real inner strength to blow the whistle on a problem and to ask for what’s needed. It may be, though, that this is the key step in handling the resistance. As mentioned earlier, there are certain instances where change should be resisted. Regrettably, in the merger environment managerial courage is sometimes in short supply. This is understandable, given the fact that the trust level is low and people are concerned about protecting their own careers. But it also helps explain why change is usually undermanaged in merging organizations.